The calculation of the kinetic parameters of a thermoluminescence material (kinetic order (b), activation energy (E) and frequency factor (s)) by using the thermoluminescence (TL) method is extremely important in determining the kinetic characterization of the materials. Sodium Chloride (NaCl) is an inorganic salt. It is a crystal well known for its luminescent properties, with a simple cubic structure and its band gap is rather large (~ 8.5 eV). In this work, it was reported the TL response of the material in the range of 50– 400 oC and calculated kinetic parameters of sea salt. Two glow peaks were observed at 100 oC and 235 oC in the TL glow curve of sea salt with a heating rate 2 oC/s after X-ray irradiation. The Tm-Tstop method was used to determine the overlapping peaks under the main peak at 100 oC. With the computerized glow curve deconvolution (CGCD) method, the peak analysis was performed. In addition, kinetic parameters were calculated using various heating rates and peak shape. The b = 1.5, E = 0.88 eV and s = 1.7x1011 s-1 values were calculated using the peak shape method. 1. Katı, M.İ. ; Türemis, M.; Keskin, İ.Ç. ; Tastekin, B.; Kibar, R.; Çetin, A.; Can, N. Luminescence behaviour of beryl (aquama-rine variety) from Turkey. Journal of Luminescence, 2012;132,2599-2602. 2. Akın, A.; Ekdal, E.; Tuncer Arslanlar, Y.; Ayvacıklı, M.; Karalı, T.; Can, N. Thermally Stimulated Luminescence Glow Curve Structure of β-Irradiated CaB4O7:Dy. Luminescence, 2015; 30,830-834. 3. Katı, M.İ. ; Sam, G.;Keskin, İ.Ç. ;Türemiş, M.; Çetin, A.;Kibar, R. Pembe Spodümenin Termolüminesans Özelliklerinin İncelenmesi ve Kinetik Parametrelerinin Hesaplanması. El-Cezeri Journal of Science and Engineering, 2016;3,258-271. 4. Keskin, İ.Ç. ; Türemiş, M.; Katı, M.İ. ; Kibar, R.; Şirin, K.; Çipiloğlu, M.A. ; Kuş, M.; Büyükçelebi,S. ;Çetin, A. Theradio-luminescence and optical behaviour of nanocomposites with CdSeS quantum dot. Journal of Luminescence, 2017;185,48-54. 5. Katı, M.İ. ; Kadiroğulları, K.; Türemiş, M.; Keskin, İ.Ç. ; Çetin, A.; Kibar, R. The Investigation of Thermoluminescence Prop-erties of Tooth Enamel. El-Cezeri Journal of Science and Engi-neering, 2016;3,297-303. 6. Murthy,D.E.K.V.R. ; Pallavi, S.P. ; Rahul, G.; Patel, Y.S. ; SaiPra-sad,A.S. Thermoluminescence dosimetric characteristics of be-ta irradiated salt. Radiation Protection Dosimetry, 2006;119,350-352. 7. Ortega, X.; Dies, X. Study of TL response in heavily irradiated rock salt. Radiation Protection Dosimetry, 1193;47,575-579. 8. Purohit, R.U. ; Joshi, T.R. Development of NaCl:Tb(T) as gam-ma and beta radiation dosimetry material, Journal of Lumines-cence, 2000; 2313(99),87-89. 9. Randall, J.T. ; Wilkins, M.H.F. Phosphorescence and Electron Traps. I. The Study of Trap Distributions, Proceedings of the Royal Socşety of London. Series A Mathematical and Physical Sciences, 1945;184,365-389. 10. Rey, L. Thermoluminescence of ultra-high dilutions of lithium chloride and sodium chloride. Physica A: Statistical Mechanics and its Applications, 2003;323,67-74. 11. Zych, A.; De Mello Donegá C.; Meijerink, A.; Luminescent salt. Journal of Luminescence, 2009;129,1535-1537. 13. McKeever SWS. On the analysis of complex thermolumines-cence. Glow-curves: resolution into individual peaks. Physica Status Solidi A, 1980;62:331–340. 14. Furetta, C. Handbook of Thermoluminescence, World Science, Singapore, 2003. 15. Che R. Glow curves with general order kinetics. Journal of The Electrochemical Society, 1969;116:1254–1257. 16. Chen, R. On the Calculation of Activation Energies and Fre-quency Factors from Glow Curves. Journal of Applied Physics, 1969;40,570-585. 17. Yegingil, Z.; Nur, N.; Dogan, T.; Yazici, N.; Topaksu, M. Ef-fects of annealing and high radiation dose on the thermolumi-nescence characteristics of natural fluorite. Radiation Meas-urement, 2012; 47, 981–987. 18. Yazıcı, AN. ; Öztürk, N. Analyses of the isolated glow peak 6 in CaF2:Dy (TLD-200) following post-irradiation annealing at 145 oC. Nuclear Instrument and Methods B, 2001; 174, 499-506. 19. Pagonis, V.; Kitis, G. On the Possibility of using Commercial Software Packages for Thermoluminescence Glow Curve De-convolution Analysis. Radiation Protection Dosimetry, 2002; 101 (1-4), 93-98. ISNAD Çetin, Ahmet , Türemiş, Murat , Keskin, İlker Çetin , Kati, Mehmet İsmail , Taştekin, Bora , Çipiloğlu, Mustafa Ali , Kibar, Rana . "The Investigation of Kinetic Characterization of Sea Salt via Thermoluminescence Method". 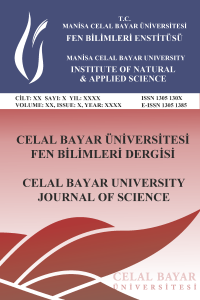 Celal Bayar University Journal of Science 13 / 4 (December 2017): 845-849.